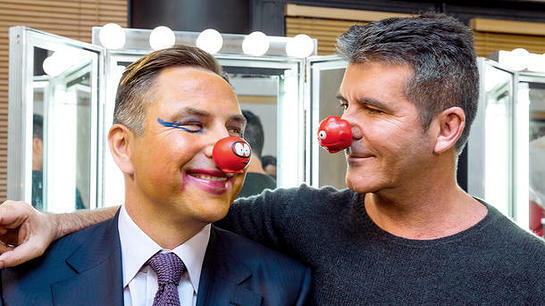 Simon Cowell and David Walliams took their bromance to another level earlier this week, as Simon showed off his face painting prowess by making David’s face funny for Red Nose Day. The pictures were released to mark the launch of this year’s Red Nose Day campaign. Tess Daly and Rochelle Humes are also making a splash with their slap, all in the name of charity. The brave pair let husbands Vernon Kay and Marvin Humes loose on their lippies for Comic Relief. David, Tess and Rochelle hope that their resulting makeovers will inspire the public to make their faces funny for money this Red Nose Day which takes place on Friday 13th March. These celebrity duos prove how easy it is to make your face funny for money this Red Nose Day, and whether the public paint their face, wear a Red Nose or let their kids do their make-up, they’ll be joining millions of people up and down the country as they raise life-changing cash. The public can top off their funny faces with one of the nine new Red Noses to choose from. They’re a right bunch of characters and are hiding away in special surprise bags, available at Sainsbury’s, Oxfam and rednoseday.com. The celebrity pairs are joined by a host of famous faces launching this year’s campaign including Claudia Winkleman and Fearne Cotton. Many can be seen donning the Red Nose along with one of seven different Red Nose Day T-Shirts designed by Anya Hindmarch, Diane von Furstenberg, Henry Holland and Matthew Williamson. The collection, which also includes a onesie, is now available exclusively from TK Maxx and tkmaxx.com. 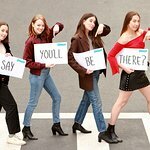 The campaign will culminate in a brilliant night of TV that will be broadcast live from the London Palladium, for the first time ever, on Friday 13th March at 7pm on BBC One. 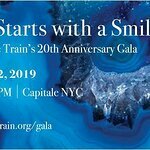 Some of the nation’s favourite personalities, including Davina McCall, Lenny Henry and Claudia Winkleman will present an unforgettable evening of entertainment packed full of celebrity performances, comedy gold and silly spoofs. The public will also be treated to never-seen-before sketches. Dawn French returns as Geraldine Granger, Vicar of Dibley, as she campaigns for the role of Bishop amongst stiff competition from a host of familiar faces. Rowan Atkinson will return to Red Nose Day as Mr Bean, and there will be highlights of Peter Kay’s Phoenix Nights Live starring Peter Kay. As well as this there will be special edition of The Great British Bake Off: An Extra Slice presented by Jo Brand, and stand-up performances from Trevor Noah and Cardinal Burns. Other TV treats include the first ever The People’s Strictly for Comic Relief, where inspiring members of the public, nominated by their friends and family, will partner with professional Strictly dancers to take on the glamorous ballroom challenge. The Great Comic Relief Bake Off makes a star-studded return as 16 celebrity bakers, including Abbey Clancy, Gok Wan and Jonathan Ross, try to raise as much dough as possible for Red Nose Day. Strictly Come Dancing’s Claudia Winkleman will call on the nation to take part in the first ever Comic Relief Danceathon on Sunday 8th March. The six hour non-stop dance frenzy will take place at The SSE Arena, Wembley and in locations across the country. Also donning his dancing shoes will be Dermot O'Leary who will bust out his best moves on Dermot’s Day of Dance for Comic Relief in an extraordinary fundraising feat as he boogies non-stop for a staggering 24 hours. Fundraisers feeling inspired can get involved by wearing a wig, donning a daft disguise or text- donating a silly selfie to make their face funny for money. To top it off, for a limited time only the public will be able to perfect their funny face pout by picking up Rimmel London’s limited edition ‘Red Nose Red’ lipstick by Kate for Comic Relief.